Interview with Dr. Hendrik Schafstall of Simufact by d1g1tal AGENDA. Dr. Schafstall, what makes your company deal with additive metal manufacturing? We at Simufact have set ourselves the general goal of numerically reproducing production processes. And this includes additive manufacturing. Our first product in this regard focuses on the widespread powder bed melting, which is only possible in a limited space — the machines have a typical construction area of a maximum of 800 x 400 mm. This is reflected in the simulation, because such volumes are easy to handle numerically. Here, we focus on the modeling of manufacturing parameters that affect the final part. What do you understand by ‘modeling manufacturing parameters’? An important result of the simulation are precise statements about the final shape of the components. This manufacturing process is carried out at very high temperatures, leading to residual stresses and as a result of that to deformations. We make these effects visible with our software. Furthermore, we also investigate follow-up operations: After layering, the part is separated from the building board of the printer and the support structures are removed. Separation can cause internal stresses too. Following this, the component can be heat treated to relieve stress and achieve a uniform texture. Owing to the welding process in the powder bed, the component material can become porous and therefore susceptible to cracking. This is very dangerous in aerospace applications, which therefore usually entail a hot isostatic pressing (HIP) process. In this so-called HIP process, the material is heated from the outside under pressure in order to close any pores. Our Simufact Additive software also takes this processing step into account in order to deduce what the final component actually looks like. In addition: Printing is known to lead to rough surfaces that need to be smoothed or polished by subsequent machining. We believe that these add-on steps must also be included in the analysis in order to take into account as far as possible all the effects that cause costs and to be able to optimize the manufacturing process in its entirety. What ideal user do you have in mind with Simufact Additives? We have created a solution that maps the entire scope of the process steps mentioned before. The software is primarily aimed not at the calculation engineer, but at the user with a manufacturing background. He brings the necessary understanding of the relevant degrees of freedom in production and can achieve meaningful optimization of the process by playing through possible variants. 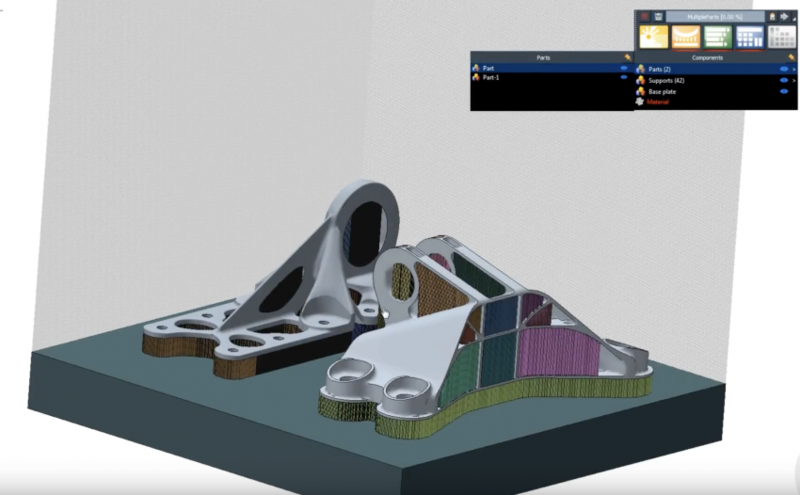 Simufact Additive is really new, we launched it in November 2016. In the first step, we concentrated on ensuring a very high quality of results — calculated geometries, warping, residual stresses that are very close to reality for all possible structures, some of which are extremely detailed. Which are the next steps the user can expect? We are in the process of implementing optimization algorithms to provide the user with suggestions based on what-if loops with automated variational calculations — e.g. optimal in terms of the geometry accuracy, but also in terms of cost issues. We will bring this consistent next step to market with our upcoming release in the middle of this year. What are the most noteworthy challenges of modeling techniques? First of all, the models are huge in terms of dimensions. An enormous number of layers must be mapped efficiently in order to recognize a trend within a short timeframe, enabling intervention with targeted optimization. At the moment, we need computing times in the range of months or even years, which is completely unacceptable. Hence, first-of-a-kind concepts of simplification are required that provide satisfactory results without too much loss of accuracy. We are currently working on that. However, any new idea for an algorithm needs to be carefully validated, particularly when it comes to aerospace applications that require very reliable statements. How do you rate the entry of major players such as GE or BASF into the 3D printing realm? Even the production of a metal powder is extremely expensive. It must be ensured that the grain sizes are as homogeneous as possible; that is very expensive. At present, new alloys are under development, which have special properties for additive manufacturing. The automotive industry is waiting for these results. So far, mainly Ti alloys, Inconel (Ni-base alloys), Al alloys and a restricted amount of steel alloys are available. But there’s a lot going on in the exciting field of materials research. …in other words, it can’t be done without simulation… …definitely not with the new materials, because there is hardly any experience with them. Moreover, machine control is a very short-lived business. The basic knowledge must be laboriously worked out, with neither time nor money in abundance. That’s why the simulation is so extremely important.